We support a rigorous program of organ study, emphasizing applied lessons, collaborative skills, choral conducting, organ literature, organ pedagogy, sacred music skills, improvisation, and advanced keyboard skills. Our internationally recognized faculty provide one-on-one support. Applicants to our Bachelor’s program usually pursue a Bachelor of Music in Applied Music. Applicants with a strong piano background who wish to apply for undergraduate organ study may elect to perform their audition on the piano. Applicants to our Doctoral program are required to hold a Master’s degree (preferably in applied music) and pursue the Doctor of Musical Arts in Performance (Keyboard Track). Extremely gifted organists who have completed a bachelor's degree may pursue the prestigious Certificate in Music Performance. 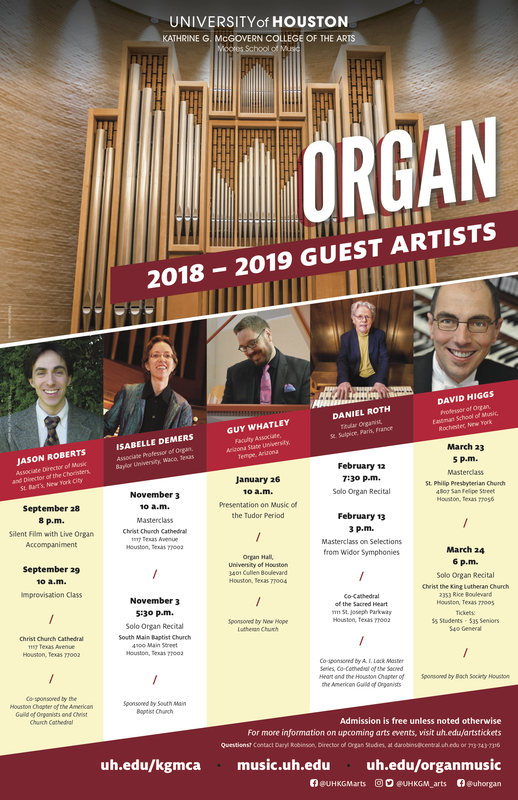 Applicants are all strongly encouraged to contact Daryl Robinson, Director of Organ Studies, to discuss scholarship, fellowship, and internship possibilities. We offer generous scholarships to UH organ majors of all levels and for students entering in either the fall or spring semesters. Most organ majors also receive an out-of-state tuition waiver, so they pay the Texas tuition rate regardless of current residency. Many UH graduate students in organ serve as teaching assistants in history and theory in the Moores School of Music. Each year, one teaching assistantship in organ is available to a graduate organ major. Established organ internships at Christ Church Cathedral (Episcopal) and at St. Philip Presbyterian Church afford students valuable paid professional experience. Additionally, Houston has a wealth of active sacred music programs; information about available opportunities may be found by visiting the Houston Chapter of the American Guild of Organists. Study of organ literature before 1800 coordinated with the development of the organ as a musical and mechanical instrument. Advanced score reading and figured bass; transposition; console management; accompanying hymnody and various forms of chant; improvisation for sacred services. Weekly assignments of standard choral and solo literature; adapting piano and orchestral scores to the organ; rehearsal techniques as both accompanist and conductor; fundamentals of vocal pedagogy. An in-depth study of a selected composer or genre and its performance practice. Students will research, present, and prepare representative works to be coached in class, culminating in a class recital. January 26 at 10 a.m.
February 12 at 7:30 p.m.
February 13 at 3 p.m.
March 23 at 10 a.m.
Concert artist represented by Karen McFarlane Artists, Inc. The Moores School is home to five pipe organs, including the III/49 Beckerath organ housed in the Organ Hall of the Fine Arts Building. All pipe organs on campus, including the Beckerath organ, are available to organ majors 24/7. Additional practice instruments include a continuo organ by Bennett & Giuttari, and harpsichords by Willard Martin and John Phillips. Degree recitals are performed on instruments by Aeolian-Skinner, Fritts, Nichols & Simpson, and Pasi free of charge through agreements with local churches.